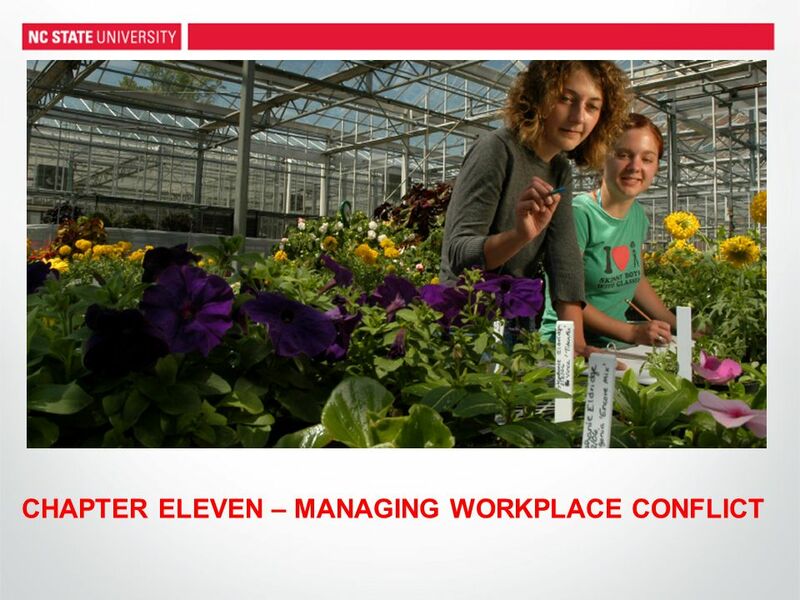 CHAPTER ELEVEN – MANAGING WORKPLACE CONFLICT. 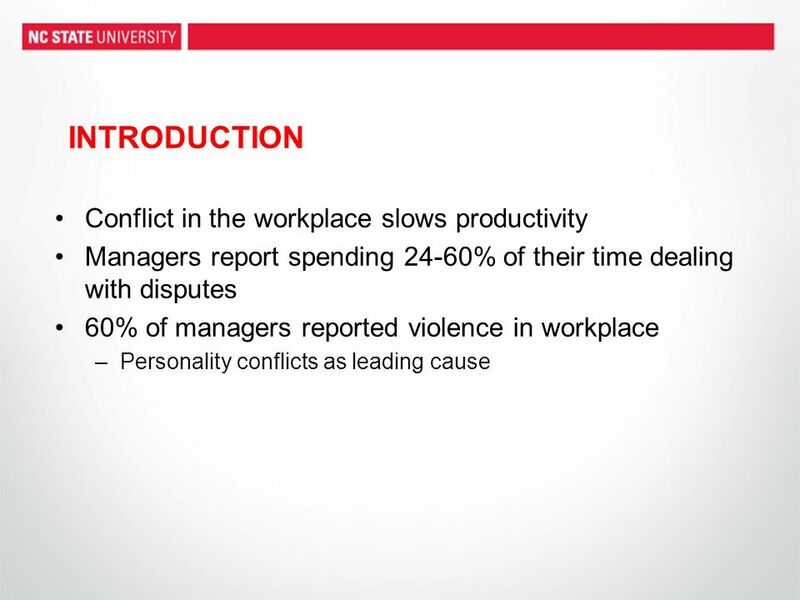 INTRODUCTION Conflict in the workplace slows productivity Managers report spending 24-60% of their time. 7 EXERCISE ONE – Where Does The Time Go? 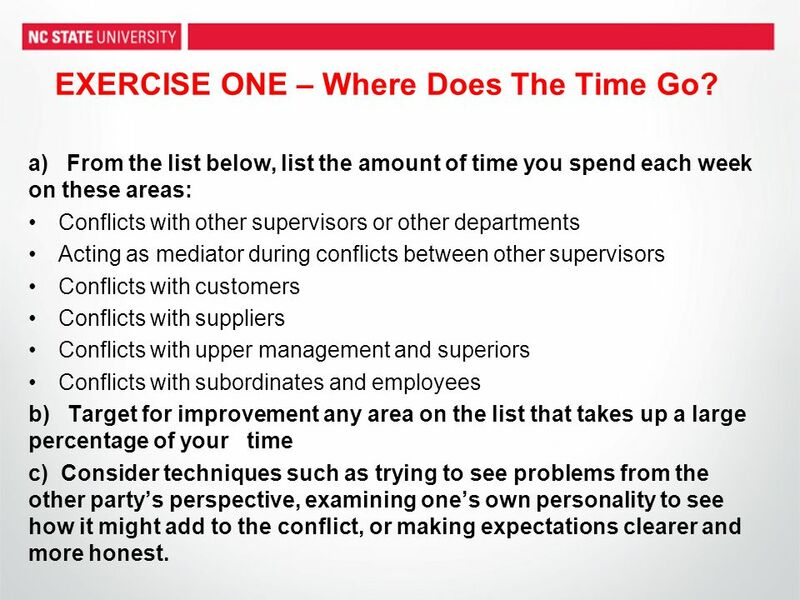 a) From the list below, list the amount of time you spend each week on these areas: Conflicts with other supervisors or other departments Acting as mediator during conflicts between other supervisors Conflicts with customers Conflicts with suppliers Conflicts with upper management and superiors Conflicts with subordinates and employees b) Target for improvement any area on the list that takes up a large percentage of your time c) Consider techniques such as trying to see problems from the other partys perspective, examining ones own personality to see how it might add to the conflict, or making expectations clearer and more honest. 8 EXERCISE TWO – Step Into Others Shoes As the mediator or boss, ask the parties involved to swap roles Have them read each others job description, with their managers present to explain their expectations of each worker Instruct them to take up each others job responsibilities and give a thought to meeting that job criteria. Have each party make a suggestion based on the other persons point of view. 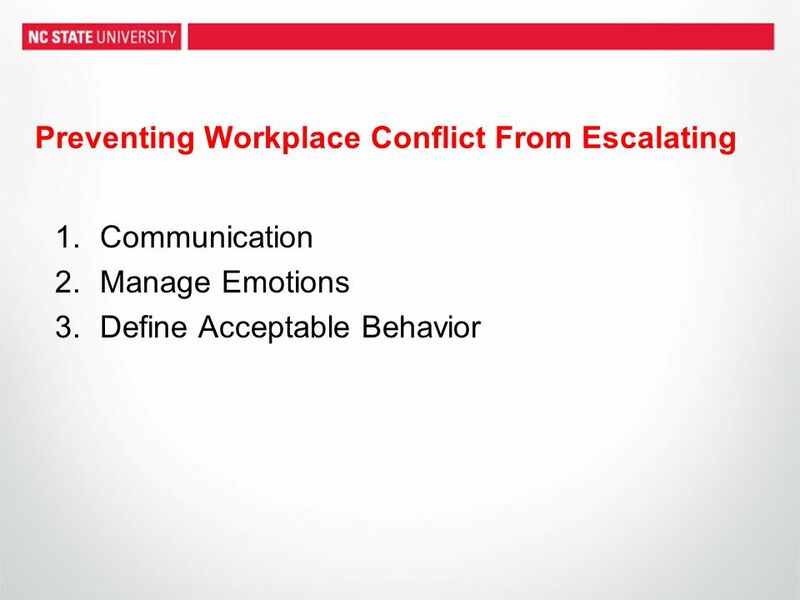 Download ppt "CHAPTER ELEVEN – MANAGING WORKPLACE CONFLICT. 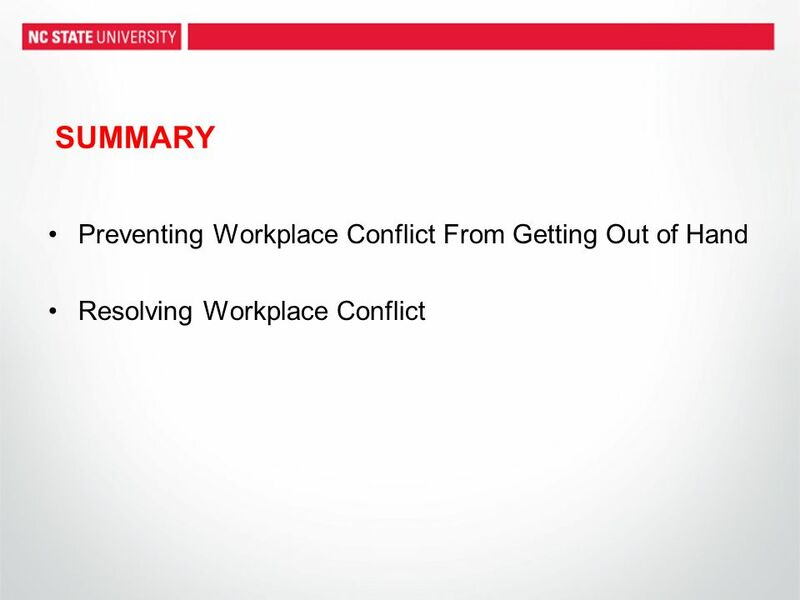 INTRODUCTION Conflict in the workplace slows productivity Managers report spending 24-60% of their time." CHAPTER FIVE - MOTIVATION. INTRODUCTION What motivates you? –Success, money, standing out –Creating change, volunteering How do we motivate as managers? CHAPTER EIGHT – ORGANIZATIONAL CULTURE. INTRODUCTION Defined: Collective behavior of humans who are part of an organization and the means that the people. Effective Anticipation and Detection of Hazards Effective Anticipation and Detection of Hazards Effective Prevention and Control of Hazards Effective Prevention. "The best general is the one who never fights."
. © 2003 Ownership Associates Home Standard Deal How it works Three Pieces Return on Effort The Deals Summary New Deal < Go. Chapter Thirteen Human Resource Management © 2007 The McGraw-Hill Companies, Inc., All Rights Reserved. McGraw-Hill/Irwin Introduction to Business. Overcoming Fear in Having Confronting Conversations in the Workplace – More Than a Matter of Semantics. Presented by Lisaanne Markowitz November 19, 2003. PREVENTING WORKPLACE VIOLENCE OBJECTIVES Understand the nature of workplace violence Spot early warning signs Apply proven techniques to handle situations. NOT FOR SALE: Ethics in the Workplace.  Imagine you are a newly hired sales clerk in the Young Apparel department of a large department store. You are. Can’t We All Just Get Along.  The Dictionary Definition – Conflict: A state of opposition between persons or ideas or interests - A very abstract definition. HRD3eCH10 Contributed by Wells Doty, Ed.D. Clemson Univ1 Performance Management and Coaching Chapter 10. © 2001 by Prentice Hall Appraising and Managing Performance. Labor Relations, part 2 OS352 HRM Fisher Nov. 20, 2003. Unit: Communication. 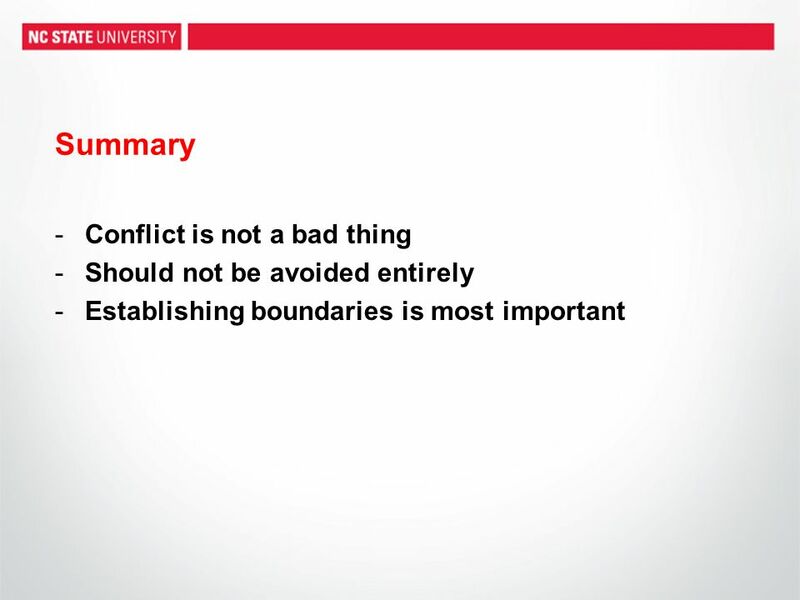 Conflict is a normal part of daily life. 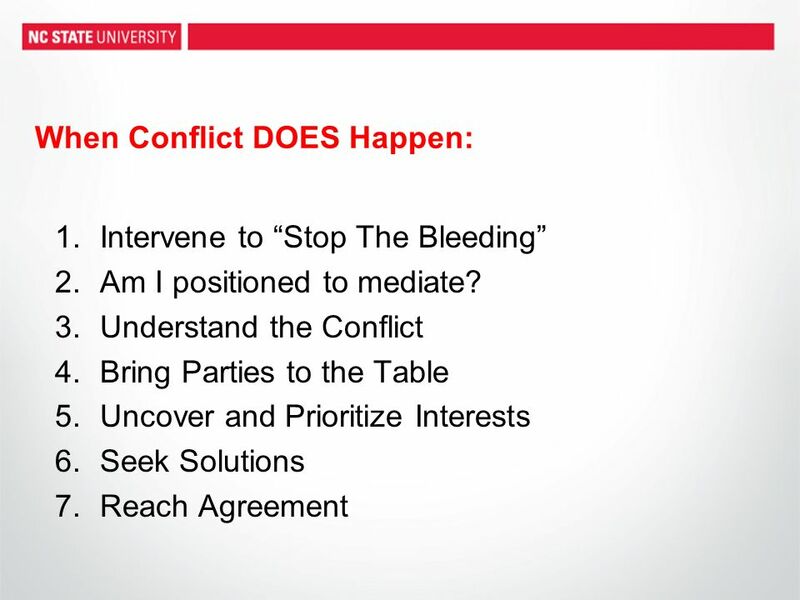 * Can learn methods to handle conflict in a * Heath care workers need to develop the skills. © 2001 by Prentice Hall 7-1 7 Appraising and Managing Performance.